The gold standard for nanotechnology is nature’s own proteins. These biomolecular nanomachines — macromolecules forged from peptide chains of amino acids — are able to fold themselves into a dazzling multitude of shapes and forms that enable them to carry out an equally dazzling multitude of functions fundamental to life. 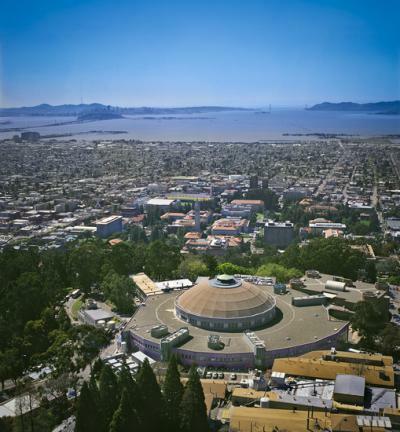 As important as protein folding is to virtually all biological systems, the mechanisms behind this process have remained a mystery. The fog, however, is being lifted. 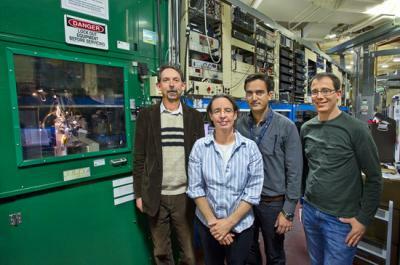 A team of researchers with the U.S. Department of Energy (DOE)’s Lawrence Berkeley National Laboratory (Berkeley Lab), using the exceptionally bright and powerful x-ray beams of the Advanced Light Source, have determined the crystal structure of a critical control element within chaperonin, the protein complex responsible for the correct folding of other proteins. The incorrect or “misfolding” of proteins has been linked to many diseases, including Alzheimer’s, Parkinson’s and some forms of cancer. Chaperonins promote the proper folding of newly translated proteins and proteins that have been stress-denatured — meaning they’ve lost their structure — by encapsulating them inside a protective chamber formed from two rings of molecular complexes stacked back-to-back. There are two classes of chaperonins, group I found in prokaryotes; and group II found in eukaryotes. Much of the basic architecture has been evolutionarily preserved across these two classes but they do differ in how the protective chamber is opened to accept proteins and closed to fold them. Whereas group I chaperonins require a detachable ring-shaped molecular lid to open and close the chamber, group II chaperonins have a built-in lid. The double-ring chaperonin complex features multiple subunits that are grouped into three domains — apical, intermediate and equatorial. For group II chaperonins, the closing of the lid for protein-folding causes all three domains to rotate as a single rigid body, resulting in conformational changes to the chamber that enable the proteins within to be folded. The synchronized rotation of the chaperonin domains is dependent upon the communication to all the subunits that is provided by the nucleotide-sensing loop. 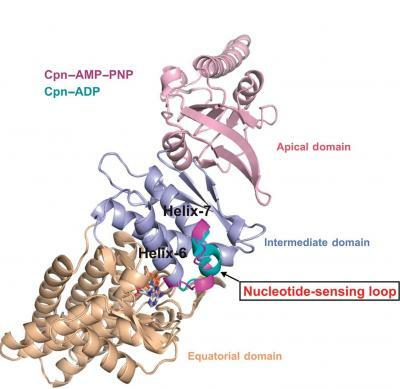 In identifying the nucleotide-sensing loop and its controlling role in group II chaperonin protein-folding, Adams and his colleagues may have opened a new avenue by which modified protein-folding activities could engineered.